While many businesses have policies that prohibit employees from peer-to-peer file sharing, BitSight has learned that this activity occurs on a significant percentage of company networks. Beyond the dangers of downloading copyrighted material, employees that engage in peer-to-peer sharing could be bringing malware onto corporate networks without their knowledge. BitSight recently observed the networks of 30,700 companies and found 23 per cent of organizations were using the BitTorrent protocol for peer-to-peer file sharing. Among these companies, BitSight also observed that 43 per cent of torrented applications contained malicious software. 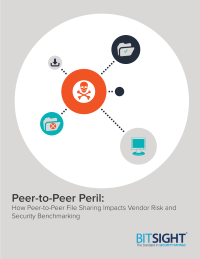 Download this report to learn the correlation between peer-to-peer file sharing activity and botnet infections, how it impacts security ratings, and why monitoring for third parties is crucial.